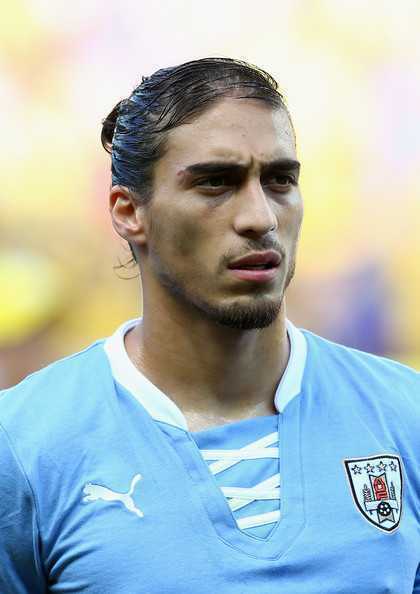 Martin Caceres is a Uruguayan professional player with highly capable and skillful playing in the position of Defender. He is playing currently in the Lazio, Italian Sports Club. His jersey number is 22. In 7th April, 1987 Martin Caceres was born in the Uruguay country. He was born and raised in the city, Montevideo. His full name is Jose Martin Caceres Silva. He is the son of Miriam Silva and Jose Caceres. His Zodiac sign is Aries. He belongs to Uruguayan ethnicity. Martin Caceres started his football career with his local team Defensor. There, he becomes a regular at a young age and competing in one full Primera Division seasons. After that, in February 2007, he signed for Spanish club, Villarreal in the early age, with the deal of being made effectively on July and onwards. After the arrival to Villareal, he was immediately sent on loan to other La Liga club where he played very well. He again joined FC Barcelona after Villarreal on 4th June 2008 with a reported transfer fee of €16.5 million during his only season at the Camp Nou he featured sparsely, due to both injury and technical decisions. Without a goal He capped 13 games for this club. On 6th August, 2009 he was again sent by Barcelona on a loan to the Italian Giants Juventus. He scored two goals there in 26 games. After the clearance of the loan, he joined to the Sevilla, Spanish Club on August 30, 2010. This club signed him for a permanent move from Barcelona on the date of 31st May, 2011. Martin Caceres again returned to Juventus club in 25th May, 2012 by signing a four year contract. There, he played 51 games and scored 3 goals. He further left for Southampton on 16th February, 2017. He signed an initial contract until the end of the season. He made his club debut after 10 days against the club Manchester United. Later, in August 2017, he signed with the Club Verona agreeing a year contract. Caceres joined Lazio on 8th January, 2018 on a one year contract with the option for a renewal. Martin Caceres had played Junior as well as senior teams of his national side in international side in international campaigns. He played for the Uruguay under-20 team in 2007 FIFA World Cup which is held in Canada. He appears all the games till round of 16 exits. He was also named as the best defender at the 2007 South American Youth Championship. On 12th September 2007, he made his debut for the full side in Johannesburg against South America. He was also listed of 23 player squad in 2010. He was also appeared in five out of six games during the tournament. He made four appearances in the 2013 FIFA Confederation cup for his nation, Uruguay. He was also included in the Uruguay’s final 23 man squad in the 2018 World Cup in Russia. He was also a main player along with Luis Suarez and Edinson Cavani who played in the FIFA World Cup 2018. Currently, Martin Caceres is having a relationship with his teenage girlfriend, Natalia Sommaruga. They are not married yet but they have two children, a son and a daughter. The name of their son is Leo Caceres and Daughter is Martina Caceres. His height is 1.83 m. As of 2017, he has an estimated net worth of $13 million. His annual salary is $3.2 million.